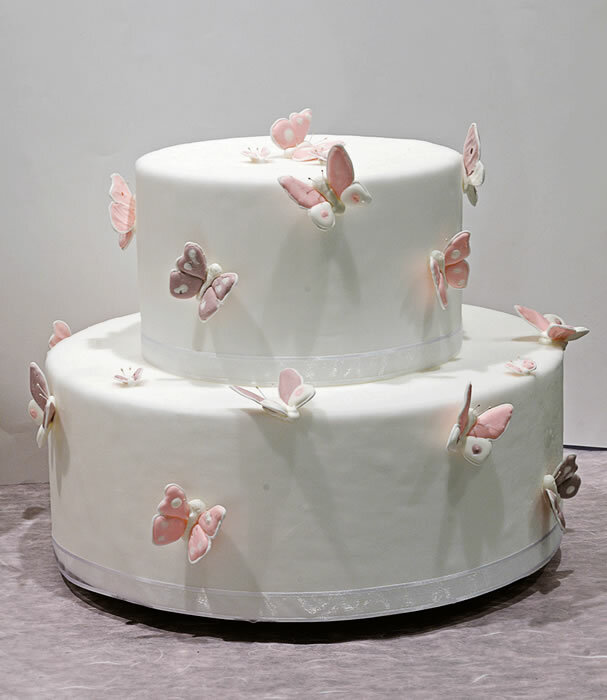 The butterly cake has a traditional sponge base filled with vanilla butter cream and chocolate chips. The sponge is lightly soaked, only in the inside, using a liquid aroma, that is high in sugar content, flavoured with orange juice or strawberry. A thin spread of white butter cream enables a complete covering with the sugar mass. The decoration consists of previuosly prepared icing butterflies. Whisk the egg whites, add the icing sugar and beat, lightly at first, then once with the sugar incorporated, at maximum speed for one minute. Add the lemon juice and beat for another minute. 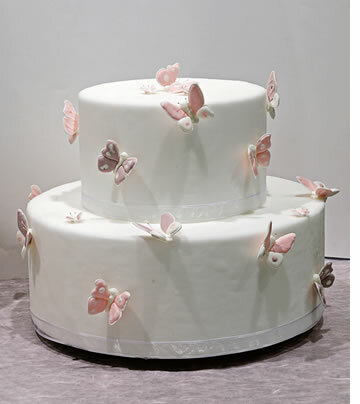 Very romantic pink butterflies take flight from the white cake, in an appealing three-dimensional display. Gino Fabbri decorates with a mass of sugar and frosting, instead of pulled sugar. On baking paper, draw the half butterflies (right and left side), then using the sac-à-poche make a few edges in icing, adding a few drops of water and possibly some colours of your choice. Let it dry for a day. The next day, fill in the spaces on the inside of the dry edge using more liquid icing of a different colour, depending on the request. Let it dry overnight. The next day, attach the wings with the icing and add the antennas; place them in an uneven mould that gives the effect of half-closed wings. The ideal is for the butterflies to be slightly different to each other, both regarding the opening of the wings and their shape, so as to look like different species. The work takes a long time, but the end result is worth it.